Netflix has made a name for itself by producing quality and popular shows such as Daredevil, House of Cards, and Orange is the New Black. One of their latest offerings is a show that seems to blend such classic fare as The Goonies, The X-Files, and Poltergeist. 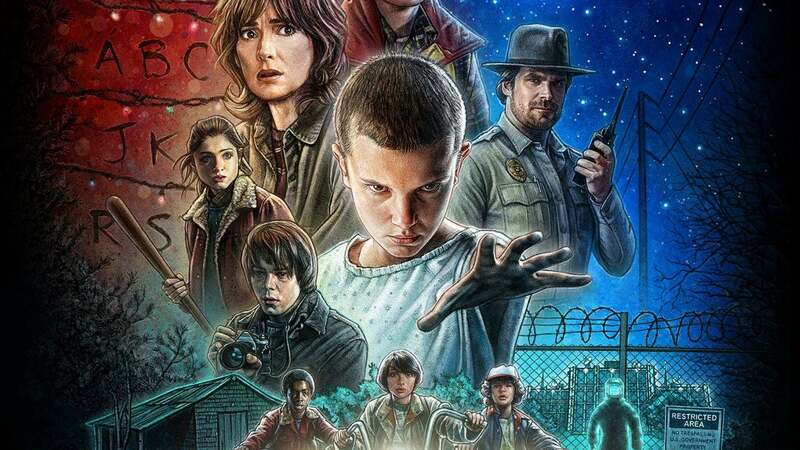 The show is called Stranger Things. IMDB gives this synopsis: When a young boy disappears, his mother, a police chief, and his friends must confront terrifying forces in order to get him back. We're going to recap the first episode, so pull out your tin foil hats, and if you haven't guessed... spoilers ahead. We open with a view of the night sky telling us the location and the date: November 6th, 1983, Hawkins, Indiana. The camera pans to a building that we learn is owned by the U.S. Department of Energy. The scene shifts to a hallway in the building where lights flicker. The camera focuses on a door just before a man bursts out of it and an alarm begins blaring. The man runs down hallways to an elevator where he punches the button repeatedly, terrified. A ding and the elevator opens, and he's again pressing buttons. In a moment that could belong in Jurassic Park he hears an animalistic noise and slowly looks up before he is grabbed and pulled out of the camera's view. Now we're in front of a typical middle-class home with a sprinkler spurting water and a child's almost ominous voice speaking. "Something is coming," he says. Quickly we see that there isn't really anything coming. The child is one of four boys playing a board game (Mike, Will, Dustin, and Lucas). The creature he speaks of is a part of the game. They are attacked by one of the game's most vicious monsters, and Will has the chance to roll a fireball to destroy it or a protection spell. Hoping to attack the creature, he rolls for fireball, but his dice fly all over the room. Before they can find the dice, Mike's mom informs them it's time to wrap it up. Will, Dustin, and Lucas say goodbye to Mike before heading out on their bikes, but not before Will informs Mike that the game monster got him. After racing Dustin, Will ends up on a road alone, driving by a Hawkins lab sign. Suddenly a silhouette of a Slender Man-esque creature pops up in front of him, and he crashes into the woods. He leaves his bike and runs home, locking the door. No one is home, but he sees the shadowed creature coming toward the house. He tries to use the phone but only strange noises come from the receiver. The dog barks and there are more scary noises and strange thumpings. He sees a shadow through the frosted glass of the front door, and the lock opens. Done with it, Will runs out back to the shed where there's a gun and some ammo. Shaking, he faces the door, but we see movement rise up behind him. He turns. The light goes out and he is gone. The titles play and we are treated to a nostalgic 80s trip. The town's Sheriff, Hopper, lays on a couch in his messy trailer while the TV plays information about mysterious power outages in the community. Beer cans are strewn everywhere. Awakened by a dog, he takes a smoke before getting ready for work, mixing medication and beer before he smokes again. Yeah, we get it. He probably has an addiction problem. Back at the Byers' place the morning after the incident, Will's mom and his teenaged brother Jonathan finally figure out he's missing as they both worked late the day before. A phone call to Mike's mom reveals that he isn't there either. Curiouser and curiouser. Will's friends arrive at school wondering where he is. They're approached by bullies who do the classic bully thing and make fun of them. Next we see Mike's sister, Nancy. Nancy and her friend, Barb, talk about a boy named Steve and Nancy's blossoming relationship with him, which Nancy claims isn't really happening just before getting a note from Steve to meet her in the bathroom. They make out (ew) and arrange a studying date that Steve would like to be a real date for later that night. Meanwhile, Hopper walks into work to find Joyce Byers, Will's mom, in his office. Next thing you know, Hopper is trying to console her while filling out a missing ad. 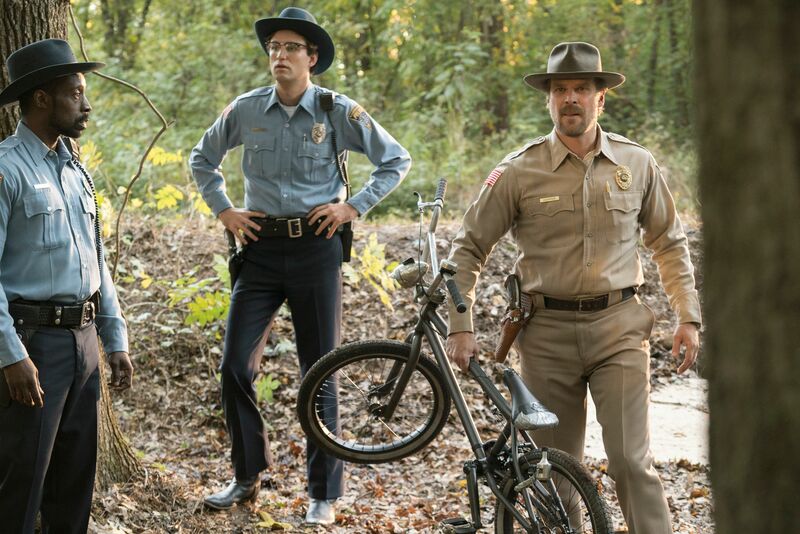 Hopper suspects Will's absent father is the reason Will's missing. Joyce begs Hop to find her son. Elsewhere, dark cars pull up to the Department of Energy Van from earlier. Usually dark cars mean danger in these shows. The men leave the vehicles with briefcases. They approach a white haired man: Doctor Brenner. He leads them down the same hallway the man was running in at the beginning of the episode. They put on suits and helmets before entering a quarantined area. The area is dark, so they use flashlights. Dark splotches and a gooey substance mar the walls. They walk through the door from the beginning and find a large greenish growth of some sort that almost seems to breathe. One of the men asks, "Is this where it came from?" Whatever "it" could be is confirmed to have emerged from the thing. The next question is, "And the girl?" Brenner replies, "She can't have gone far." The scene changes to show a child with bare feet and a shaved head wearing a hospital gown. The gender is hard to decipher but I assume it is the girl mentioned in the previous scene. She watches a man take trash out of a restaurant, then enters the building herself. Hungry, the child locates a basket of fries which she unceremoniously digs into. I already like this kid. The fries party is cut short when the restaurant owner spots her. She runs away but makes sure to take the fries with her. A girl's gotta eat. He catches her, at first mistaking her a boy stealing from him, so he's greatly surprised when he realizes she's a girl. The scene switches to the middle school, where the science teacher, Mr. Clarke tells Mike, Will, and Dustin about the arrival of a radio whose signal can reach all the way to Australia, much to their excitement. Turns out they're the AV club. Their fun is cut short when Hopper arrives to question them about Will's disappearance. Mike tells him that Will takes Mirkwood, instigating a brief argument about Middle Earth. Because Hopper doesn't know what he's talking about, Mike explains that they made up the name and tells him the real name. When they offer to help search for Will, Hopper warns them not to get involved. Flashback to Joyce talking to Will in his clubhouse, showing him tickets she bought for them to see Poltergeist. She teases Will about his old fears, and then we are in the present where Joyce and Jonathan are searching for Will, including checking his empty clubhouse. In the restaurant, the owner makes the mysterious girl a hamburger. He questions her about her appearance, wondering if she was afraid and ran from a hospital. When she refuses to answer he takes her hamburger away. Nobody touches this girl's food. Nobody. He promises to give the food back if she answers some questions. First, he asks her name and introduces himself as Benny. When he shakes her hand he notices an eleven tattooed on her wrist. He asks what it means. Speaking for the first time she says, "No," so he starts to take the food away. She stops him by mentioning the eleven. Then she points at herself. He gives the food back. Next thing you know he's on the phone with social services worried that she's in trouble. 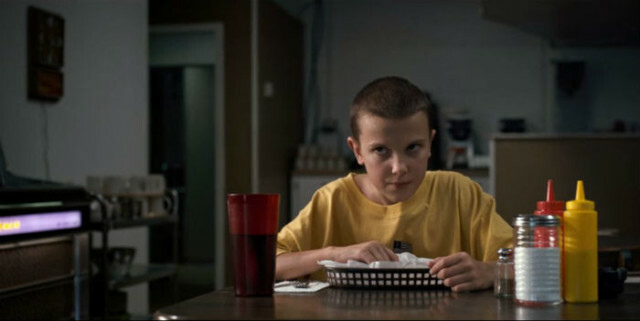 As she finishes her food, Eleven is annoyed by a rattling fan. She stares hard at it and it comes to a stop. Ooh. So she has powers. The scene changes back to the town where the police are searching for Will. The sheriff pops a pill. Not sure if they're prescribed or he's "self-medicating." They find his bike, but no Will. Now it's almost settled that he didn't run away. The sheriff makes a comment about how he wouldn't have left his bike. In another room, people are sitting with headphones on listening to phone calls. 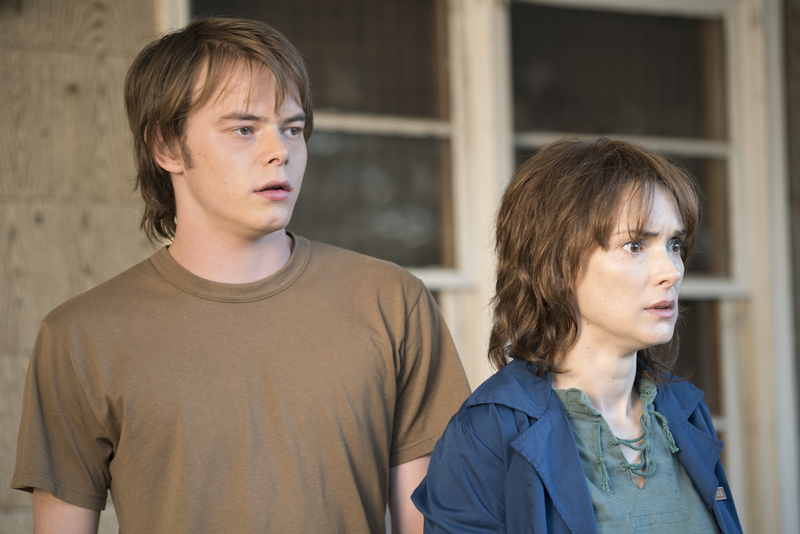 One listens to a conversation between Joyce and her ex-husband's girlfriend before the camera shifts to the Byers' home where Joyce is on the telephone and Jonathan is making missing signs. The girlfriend hangs up on Joyce, whom Jonathan encourages to remain calm. Joyce calls her ex-husband and leaves a message about Will. Police arrive with Will's bicycle. Hopper and his men search the house, noticing a hole in the wall caused by the front door hitting it which Joyce chalks up to an accident. In a classic scenario, the dog barks at the shed. Hopper looks inside, finding the bullets. The light goes off. He picks up a flashlight and finds some broken boxes. He's looking around when one of his deputies startles him. Apparently spooked, Hopper orders a search party. Back at the Wheeler house, Nancy and Mike are having dinner with their family. Mike wants to help search for Will but his mother quickly shuts him down. Nancy takes the opportunity to lie to her mother and request permission to study with Barb. We know what you're up to, Nancy, and it isn't studying with Barb. Once again, Mom Wheeler shuts it down, saying nobody can go out with what's going on. Nancy blames Will which causes an argument between her and Mike. The priceless part of the scene is the youngest Wheeler, Holly's, reaction to the fracas. I could just see this child eating popcorn. Mike lets info about Steve slip, which causes the inevitable parental questions about this Steve character. Nancy is displeased and storms off. Mike gets upset at his parents since he feels he's the only one that cares about Will while Holly nonchalantly chugs her juice. She knows when not to get into drama. Dad, or Ted Wheeler, assures Mike that they do care, but Mike storms out anyway, after which Mom leaves with Holly, leaving Ted confused as to what he did wrong. The scene changes to the forest at night where the search for Will is in full swing. Mr. Clarke tells Hopper what a great student Will is and introduces him as the earth and biology teacher at the middle school. When Hopper mentions he doesn't like science they have short conversation about the old science teacher who lacked in her methods. Hopper mentions his daughter's understanding of space. When Clarke wonders if he might have her in his class, Hopper shuts him down with the news that she lives with her mom. When Hopper walks away, a woman informs Clarke that the sheriff's daughter is actually dead. Sadness. With an intense music note, the camera focuses on a Dungeons and Dragon board, the game the boys were playing earlier. Mike is sitting at it. He calls Lucas with his walkie talkie and they arrange to meet up and search for Will. When Mike rides off on his bicycle he notices Steve climbing the house to get to Nancy's room and rolls his eyes along with the audience. Nancy is surprised when Steve knocks on her window and protests when he enters. He trips in, claiming he's like a ninja. Back in the restaurant, Benny washes dishes while Eleven eats ice cream. After a cute moment where he compliments her smile (Benny is really such a nice guy), there is a knock at the door. Eleven is frightened, so he calms her by telling her he'll send them away. A blond woman is at the door. She identifies herself as social services so he invites her in. While he is making a comment about how different her voice is on the phone, she suddenly shoots him. Aw. R.I.P. Benny. Eleven runs, but two people are pointing guns at her. The camera shifts to Doctor Brenner in the front of the restaurant. He hears a clanging and walks to the back where the two men are on the ground, apparently dead. Eleven is nowhere in sight. He goes outside, searching. She's gone. We're back to Mike, Lucas, and Dustin doing what they aren't supposed to be doing: searching for Will. They ride their bikes down a dimly lit street. This can't be good. They pull over where a caution bar has been placed, where Will's bike was found. They go into the woods. We're back to Steve and Nancy. Steve is being a good boy and reading practice questions for Nancy to answer. Strike that. He was being a good boy. Next, he suggests playing a variation of strip poker where, depending on Nancy's correct answers, one of them has to remove an article of clothing. Nancy says no. (Duh). They start making out. "Africa" by Toto is playing in the background which seems a weird music choice for this moment but somehow works. Steve gets a bit too frisky and Nancy reminds him that her parents are home. DUH. 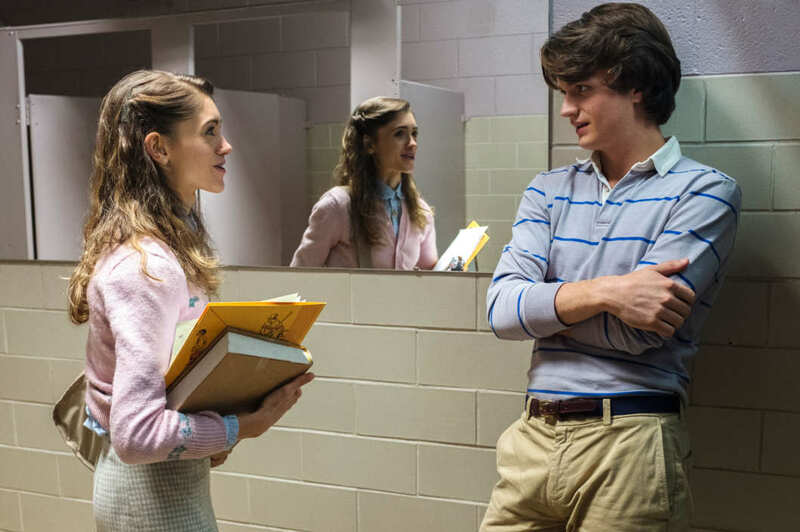 Nancy accuses him of just trying to use her as another conquest and tells him that she's not all those other girls. He acts all cute with a stuffed animal, prompting her to laughingly call him an idiot to which he calls her beautiful. They return to studying. Meanwhile, Jonathan and Joyce have a bonding session while looking over pictures of Will for the missing posters. Jonathan admits that he feels guilty for not being there for Will. His mother insists that he can't blame himself and she feels Will is nearby. They pick a photo when the phone rings. Distorted noises come through the receiver along with breathing. An animalistic noise takes over and the phone sparks with blue electricity, breaking the connection. Joyce, crying, insists the breathing was Will's. 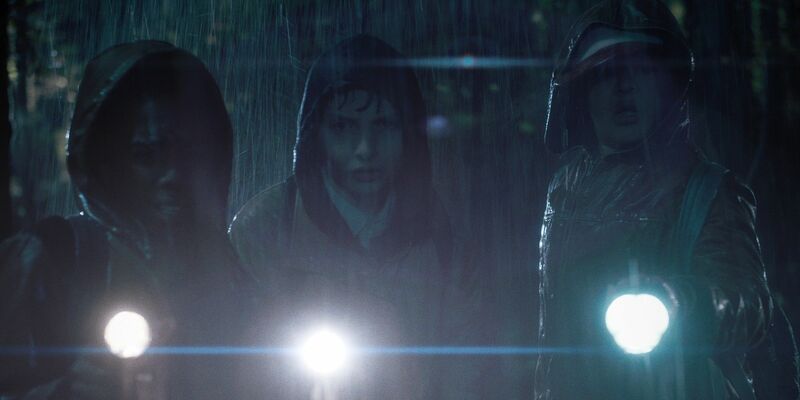 The three boys are still searching in the dark woods in the pouring rain. This scenario keeps getting better. Lucas and Dustin argue about whether they should go home. They hear a noise and all turn with their flashlights. Could it be Will? The sound comes from another direction and they turn. It isn't Will. A rain-soaked Eleven meets their gazes. The End. This was one of the strongest show pilots I've seen in a while. It was scary, funny, and well acted. If you have Netflix and have yet to start it, I'd say go for it. Keep in mind that this show is rated TV-14. In Memoriam: Random scientist guy at the beginning. We didn't see his body, but I think we all know he's dead. Benny. Poor Benny. I liked Benny. Unknown: Will Byers. He's a nice kid. Let's hope he's okay. There you have it! Have you seen Stranger Things? What do you think of it? Bethany is an aspiring author and actress. She spends her time trying to make stories up out of thin air, slaving away on homework assignments, memorizing lines, and sometimes wasting time. As a Christian, she desires every work she creates to glorify her Heavenly Father. If you're looking, you'll probably find her on the road to her next rehearsal, in her school's computer lab, or worshiping in her church.